You go through life looking to avoid risk. You look to save a dollar whenever you can. You're smart. Sensible. Responsible. But is this approach to life really the best thing for your finances? There may be times when a little bit of risk is better for you long term, or you may be so focused on one financial goal while you are neglecting another. 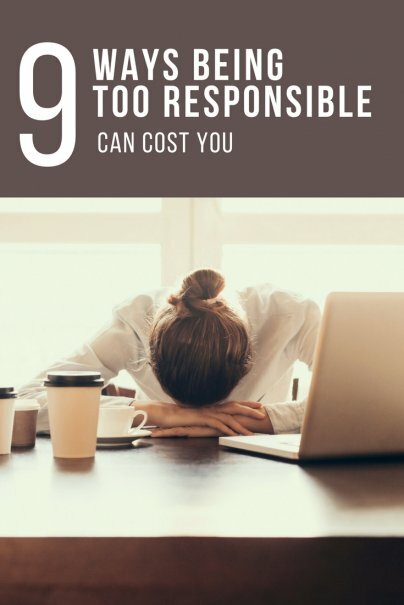 Here are some examples of when being responsible has a financial downside. It always makes sense to have a sizable emergency fund to help cover unexpected costs, like a major car repair or medical emergency. But it doesn't make sense to carry massive amounts in a low-interest savings account to prepare for every conceivable disaster. Every excess dollar you keep in a basic savings account is a dollar that could be invested elsewhere, generating a bigger return and helping you build toward retirement. Opinions vary on how big your emergency fund should be, but few financial advisers recommend saving more than nine months of expenses. Don't steal from your future self by being too concerned about possible disasters now. You're a responsible parent, and you want to help your kids pay for their college education. So you open a 529 college savings plan and pump money into it. That's great, but are you costing yourself future retirement funds in the process? In an ideal world, you can save plenty for both retirement and college costs, but it's important not to divert too much away from retirement. When it comes to saving, retirement should be your first focus. Your kids can always borrow for college, but you can't borrow money to retire. Being frugal is usually a good thing. But there is some truth to the adage that you get what you pay for. If you consistently look to purchase the lowest-end version of a product just to save a few dollars, you may cost yourself in the long run. Sometimes things are inexpensive because they are low quality. And if something is cheaply made, you may end up replacing it sooner and costing yourself more in the long run. This is especially true for bigger ticket items like appliances. The best path financially is to search for value, not simply low cost, when shopping. Just like it's not necessarily best to buy the cheapest version of an item, you shouldn't reflexively go high-end all the time, either. It's a fine idea to pay more for quality and longevity in a product, but sometimes things are expensive due to unneeded bells and whistles, or because a manufacturer wants you to believe they have a premium product. Again, it's important to do your homework and find the correct balance between quality and price. I would never advise against helping others. But there are some cases when you are putting your financial health at risk by lending others a hand. For instance, you may cosign a loan for your daughter so she can get a new car, but your credit could be ruined if she fails to make payments. You might "lend" money to your brother-in-law to start a business, even though you're fully aware he'll never pay you back. Generosity is okay, but it's best not to be too cavalier about lending or giving money to everyone that asks. You want to make sure that your retirement portfolio is protected from a stock market crash. So you invest heavily in stable investments like dividend stocks, bonds, and cash. This is fine if you are approaching retirement age. But if you're decades away from retirement, it pays to be far more aggressive. Sure, there will be times when your portfolio will take a big hit. But it will most likely go up over time, and you don't want to miss out on the years when there are big stock market gains. If you want to build the biggest retirement nest egg possible, it's best to shed your fear and invest heavily — perhaps even exclusively — in stocks when you are young. So you like your job because it's got a steady paycheck and decent benefits. Staying put seems like the responsible thing to do. But there's some evidence to suggest that people who job hop can end up earning more. According to Forbes, employees who stay in a job longer than two years will end up earning 50% less in their lifetimes than if they switched jobs more often. Consider that the average raise these days is about 3%. Do you think you could command a bigger bump by looking elsewhere? If so, consider going for it. And don't worry about a short job stint hurting your resumé. Harvard Business review reported last year that there's no longer a stigma against staying at a position for a short period of time. There's always a desire to pay off that mortgage as soon as possible. If anything, it's a massive psychological boost to know you own your house free and clear. But there is a financial downside to paying your house off early, especially when interest rates are low like they are now. Let's say you have a 3.65% interest rate on a 30-year mortgage. But let's say you could earn a 7% annual return by putting money in the stock market. Where's a better place for your money? When investment returns are higher than your interest rates, there's no real compelling financial reason to pay off a loan early. You can definitely save money if you're handy. From plumbing repairs to changing your own oil in your car, it's often silly to pay someone to take on things you can do on your own. But do you know your own limitations? There are many instances when an attempt to fix something on your own can make a problem worse. (I know this from personal experience.) By hiring a professional to handle some repairs, you may have a better chance of ensuring things are done properly and constructed to last. This will save you money in the long run. Any other ways being too responsible costs us? Do the right thing and let us know in comments! The "a 7% annual return" in the stock market is likely a thing of the past. How about this: every dollar you pay to a bank in interest permanently reduces the number of dollars you will control over the course of your life. Even if your mortgage is 3.65%, pay it off. Until savings start to equal your interest rate on the mortgage, only the bank makes money -- your money! That's solid advice. Regardless of circumstances, being debt free is very liberating. The days of the average person making substantial money off the market are long gone, even small mistakes can take decades to recover. Good thing the stock market always goes up and never corrects from low interest rates !! !